Ambience Creacions is an auxiliary opulence in the serene locale of Gurgaon . This residential development is one of the finest project crafted by the remarkable architectural manpower. You will find ultra modern utilities merged in this residential undertaking in the real time period. National Capital Region is the functional hotspot of real estate developments nowadays. This residential plan is getting developed in sector- 22 of Gurgaon. The commercial capital of Northern India is currently accelerating to be the top most hub of real estate properties in India. This development of sumptuous abodes is getting structured in the girdle of numerous essential services or facilities at present. There is the key range of educational centers, medical services, social hubs ( malls, restaurants and shopping centers), rapid modes of modernized transport services etc. Numerous fastest road passages are connected to this project. 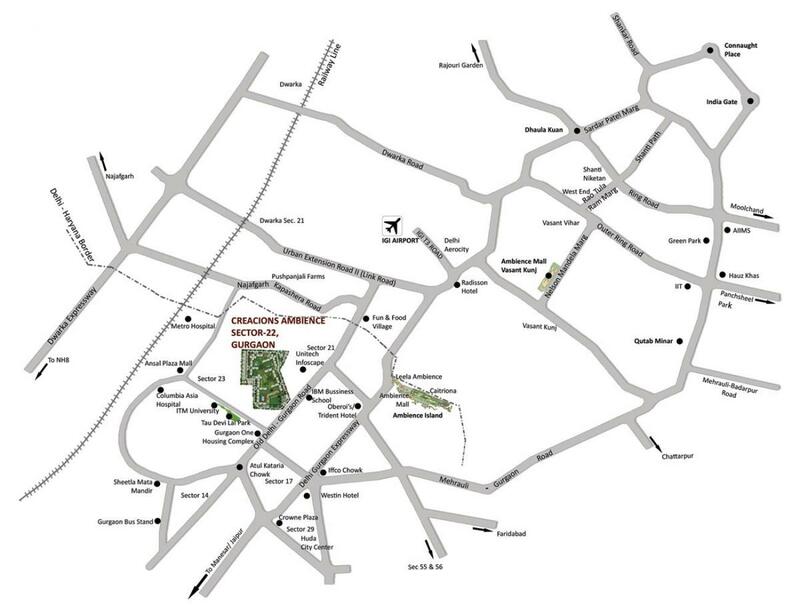 Several express road links are followed by- Old Delhi- Jaipur, NH-8, Dwarka link road, Bijwasan road etc. Gurgaon is equipped numerous transformed elements of the real time such as real estate developments and additional mega infrastructural developments such as metro railway etc. This destination is modernizing with numerous huge emerging industries of the real time. On the contrary, Ambience Creations price list is live for all the property seekers at present. Apartments are available @ Rs. 1.51 crores to Rs. 4.37 crores. Ambience Creacions Gurgaon is the composite of 2,3 and 4 BHK segments of residences getting in the area ranging from 1380 square feet to 4422 square feet. There are the key number of lush amenities planned in this development such as- clubhouse, gymnasium, swimming pool with splash, lounge, billiards room, aerobics, yoga center etc. Arrive by for a high- end or a palatial life in the serene suburb of this metropolitan. Near Rapid Metro & Colombia Asia Hospital.